Your daily vanpool commute can save you money . . . It's the perfect ride for your morning commute. It's the safe ride home at the end of the day. It's "the network" that's your advantage every day. A new vanpool network for the rest of us. Vanpooling has been highly popular with suburban commuters. These van commuters even get a tax advantage. Now the program comes to rural North Central Pennsylvania where a commute can often exceed 20 miles and last an hour or more each day. Convenience - Each van in the network has its own unique “route.” The schedule is set cooperatively by the riders. Pick up locations are arranged at convenient “park and ride” locations and other readily accessible places. The Vanpool Advantage Network takes care of routine maintenance for your vehicle. Cost Savings - Driving alone to and from work can cost more than $5,000 per year if your round trip is 50 miles per day. The same ride can cost substantially less in a network vanpool. Your car “stays home” with far less wear and tear. Everyone can appreciate this advantage. Contribution - While your commuting costs drop substantially you pay only a small amount each week that takes care of the vehicle, fuel, insurance, and maintenance. The exact amount of your vanpool cost will be determined by several factors including the total round trip miles. 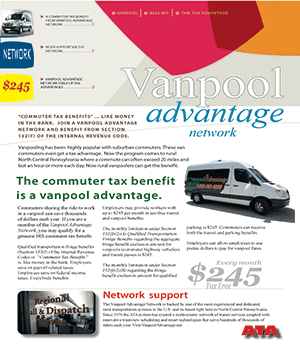 Vanpool Advantage will help you and your group to determine the amount of your contribution. 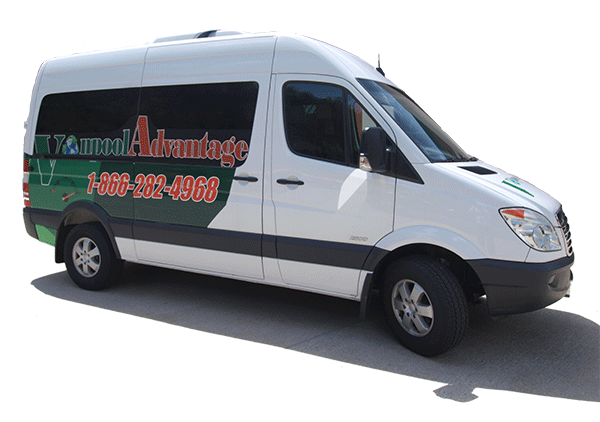 Contingencies - The Van pool Advantage network offers a Guaranteed Ride Home (GRH) service to cover those times when it is necessary to return home sooner that the vanpool departure. The Vanpool Advantage Network is backed by one of the most experienced and dedicated rural transportation systems in the U.S. and its based right here in North Central Pennsylvania. Since 1976 the ATA system has created a multi-county network of transit services coupled with innovative transview scheduling and smart technologies that serve hundreds of thousands of riders each year. 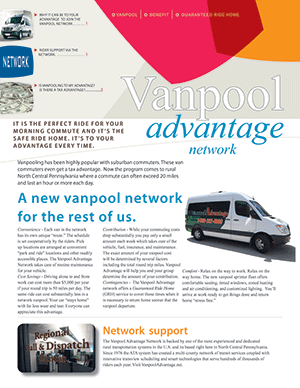 Visit VanpoolAdvantage.net. Do you travel 20 miles or more to reach your job? Do you have consistent work hours? Are you willing to share the ride to work with at least 7 other people? Do you want to save money on the cost of your commute? If you answered YES to the questions above then vanpooling is probably to your advantage. Now that the service is available there are some simple steps to take in forming your own network of vanpoolers. Locate a minimum of 7 and up to 12 people who live and work near you and who are interested in vanpooling. If you need assistance with creating a group you can contact the network by telephone. Call TOLL FREE 1.866.282.4968. After you have a vanpool group together request a formation meeting with the network. At this meeting we will review the basic route to be taken and the vehicle type to be used. We will also help you choose a group coordinator/driver and an alternate driver. Request a meeting with the network coordinator Call 1.866.282.4968. There’s one more thing. Contact your employer to see if they offer the $125 federal pre-tax benefit for vanpooling. A network representative will offer to speak with your employer about this pre-tax benefit program and how it helps you and helps them.Is vanpooling to your advantage? 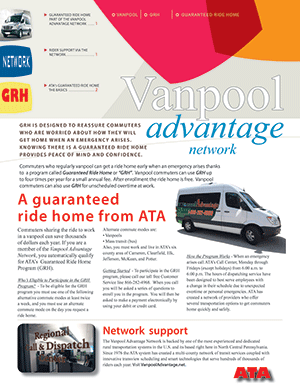 The Vanpool Advantage Network is a program operated by the Area Transportation Authority of North Central Pennsylvania (ATA). The Federal Transportation Administration Division of the United States Department of Transportation supports the Vanpool Advantage Network. The Bureau of Public Transportation, a part of the Pennsylvania Department of Transportation, also supports it.